"Opioid drugs are the leading cause of death of those 50 and under," according to Robert DuPont, MD, President of the Institute for Behavior and Health, who served as the White House Drug Chief in the 1970s. "The U.S., home to less than 5% of the world's population, consumes about 80% of the global opioid medicine supply." 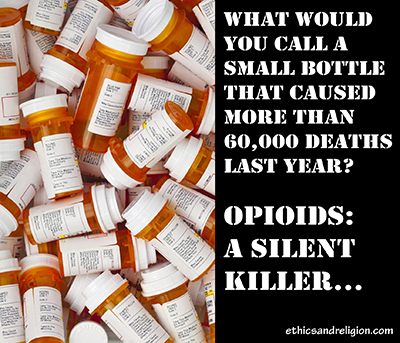 In 2012, 259 million prescriptions for opioids were dispensed in the U.S - enough for one bottle for each American adult. The New York Times estimated that in 2016, overdose deaths in America reached a record high of between 59,000 and 65,000. By contrast, only 37,800 died in car crashes and 6,500 died of AIDS. Yet President Trump refused to declare a "State of National Emergency," that was recommended by his White House Opioid Commission. Instead, he offered a brief statement of the obvious, that the "best way to prevent drug addiction and overdose is to prevent people from abusing drugs in the first place. If they don't start, they won't have a problem." As one sign of the opioid crisis, Nashville Mayor Megan Barry disclosed this week that her only son, Max Berry, 22, who had just graduated from college - died of a drug overdose. During his campaign, Trump promised that he would swiftly end the crisis by building a wall along the southern U.S. border to stop the flow of heroin into the country, boost funding for recovery programs, and approach the problem with a humanitarian mindset instead of a law-and-order one. Of course, none of those steps have been taken. Indeed, Trump's proposed budget would have imposed sweeping cuts to Medicaid spending for health care, including treatment for drug abuse. Yet this week the President pledged to "beat this situation. Nobody is safe from this epidemic that threatens young and old, rich and poor, urban and rural communities. Everybody is threatened," he told reporters at his Bedminster golf course. But he only offered rhetoric - not action. The situation was not serious enough to accept the "first and most urgent recommendation" of a Presidential Task Force headed by NJ Gov. Chris Christi, to declare a "State of National Emergency." Instead, Health and Human Services Secretary Tom Price announced that there would be a national "listening tour," focusing on stemming opioid abuse among veterans, and pregnant women who could pass along opioid related problems to newborns. What should be done about the opioid crisis? First, we must stop the drug use by youth. Alcohol abuse often begins in high school and leads many to experiment with marijuana or such opioids as fentanyl and heroin to "get high." In college, DuPont said, "You're surrounded by people who are using alcohol and drugs in addictive ways." Students who abuse alcohol or drugs have higher dropout rates and lower grades. But once students get into recovery, he said, "It's stunning how many who were failing before - are now getting A's." Rutgers University pioneered a strategy called the Recovery House where alcohol and drugs were prohibited. It attracted students who had flunked out of other schools due to their opioid addiction. One student called the "substance-free" housing "a safe place." Gov. Christi signed a law that requires every state-run college or university in New Jersey to offer "sober housing." A second major strategy is to offer long-term treatment for the addicted. Most treatment programs are short-term and do not change lives. Methadone maintenance programs, if uninterrupted, are proven to reduce arrests and increase employment of the once-addicted. Third, drug treatment must be offered in prisons. Three out of four inmates in Connecticut have a drug or alcohol problem. Yet the state's jails were not even allowed to dispense methadone! When one prison's medical director learned drug overdose deaths had doubled in six years, and two of his relatives died of their addictions, and one of his own children was a recovering addict - he belatedly fought to offer methadone treatment to prisoners. Fourth, Medicaid funds should be much more widely available to treat addicted patients with low or moderate incomes. Very few are being helped today. Finally, President Trump should declare a National Opioid State of Emergency.